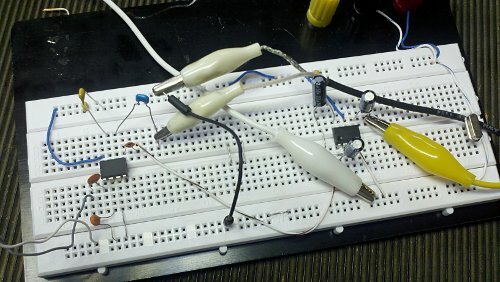 I spent part of the afternoon messing with a Direct Conversion Receiver on a breadboard. I experimented with with crystals, free running oscillators, and using a signal generator. I took the board over to N0FP's QTH and did some additional experimenting with it. We connected his signal generator to the board and a bandpass filter and spun the dial. The audio clip was captured with my DroidX phone recording the audio from the an amplified speaker. It was interesting to adjust the LO drive compared to the RF drive level.